Disorient is an interdisciplinary project, a collaboration between Ludivine Allegue and Valentina Lacmanović. 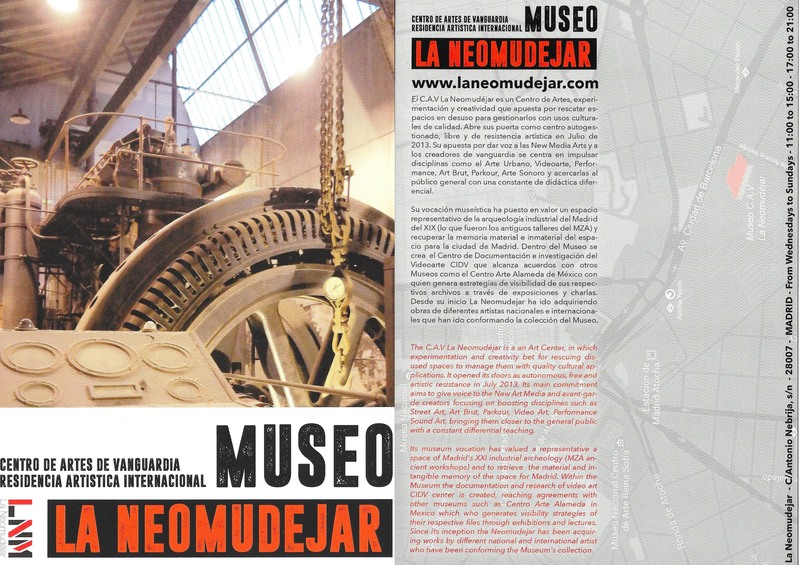 Those two artists have been working together at the Neomudejar Art center (Centro de Artes de Vanguardia, Madrid-SPAIN) – http://laneomudejar.com during an International Art Residency in March and April 2016. The premiere of the performance happened on 23 April 2016 (to see trailers click HERE). The video art, holographic installation, sound creation and composition of a soundscape, drawings, paintings and graphic works are now being finalised, and some were exposed at Museo CAV La Neomudéjar in Madrid, concluding the project’s transit at the Neomudéjar. The performance and holographic installation were presented on 3 and 4 December at Musée des Arts et Métiers in Paris, in the chapel with Foucault’s Pendulum. The project was created in co-production between the artists and Museo CAV La Neomudéjar, and with help of private investments of ‘Disorienters’ – art lovers who were touched by the essence of the project and are supporting it on its way to the audience. You too can become a ‘Disorienter’ and join the artists and the artwork in their adventure. We have plotted this project for a few years, looking for an idea that reveals the essence, the core of the human in ourselves and in our audience. There is a desire in all humans to get “lost”, disorientated, to find her/himself “somewhere else” and not understand the surrounding signs. The challenge is to feel and listen, to try not to implant the pre-conceptions or think in boxes in order to reach the human, the universal and essential in ourselves – our soul. What happens when we lose our perimeters, our orientating devices, our socio-cultural or emotional pillars? How do we cope with facing an archetypal movement, a repetition that can entrance us so that we lose ground? Can we let go and accept that the work of art can take us to the core of humanity of what connects us without explanation, without imposed narratives? Disorient is an immersive interdisciplinary experience in which we dive to find ourselves better together with you, our partners in disorientation and merging with the unknown. As the whole Universe spins, whirls and spirals, as well as the smallest particle of our sub-atomic matter, this unconscious movement is what keeps us alive and our macro-and-micro cosmic bodies together. It is our main instrument and inspiration for this project. We have worked for almost two months in the spaces of La Neomudejar in close collaboration, echoing painting and performance on one side and organically connecting the movement of the camera with the movement of the body on the other.